The dome was purchased in 1996 from Astrodomes. Some modifications was done to the original design to allow access to the outside of the dome. Also it was painted green to comply with council wishes. To rotate the dome, a continuous steel chain and sprocket was purchased for connecting the driving reversible AC motor to the dome. This design is unconventional but simple. 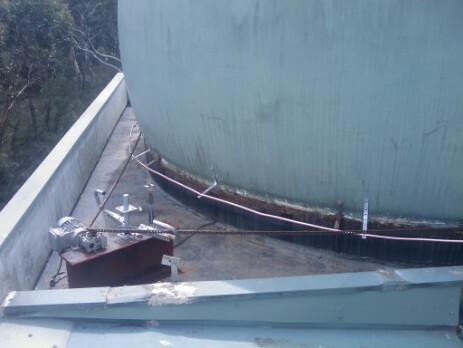 The steel chain pulled on the dome and rotate it in both direction with no gearing system apart from static friction to the side of the dome. The Dome control software turn on the motor rotation either clockwise or anticlockwise. The same program activate another reversible AC motor located at the zenith of the dome for opening and closing the hatch by means of a rack and pinion arrangements. During a regular observing session, the hatch is left open in one constant position and will be closed upon completion. On occasion when the computer froze, resetting was done remotely by means of a telephone activated modular device, eliminating the need for someone to come in and physically resetting the computer. When the ISP was recently changed to allow a new ADSL2+ connection , the changes was done seamlessly this way. Using ADSL 2+ connection with BigPond we have consistently obtained a connection of 1Mbit/sec upload speed and to a lesser significant was a download speed of 10Mbit/sec. Since the upgrade, the data download and controlling software has been improved dramatically to increase work efficiency by a factor of 8. After more than a year with the binary asteroid group, I finally landed, as a Primary Investigator, on an asteroid with its binary nature confirmed. I started observing it in early August where the light curve were showing signs of ill fitting curves with slight constant decline of brightness as shown in the 06/08 and 10/08 data. After further analysing the data I concluded that the unexpected decline may be due to poor atmospheric condition/ turbulence worsen as the target was setting. However correspondence with Brian Warner soon revealed that bloated images caused by poor atmospheric conditions could not have caused the observed lightcurves. I reported this finding to Petr Pravec and resume the observation of the minor planet 10208_1997_QN1. During the course of a few weeks, the accumulated data consisting of 13 more nights from Leura and more nights from other collaborating observatories, the light curves started to take shape as one that exhibited a primary and secondary events ( Occulting and Transiting events) and also 2 additional less pronounced shadow/ eclipses events just before the main events. This occurrence is due to the large Solar Phase Angle (20 deg) where the event took place and also the relatively large separation (semi major axis / Primary diameter ratio or A/P_1 = 4.42) between satellite and main body of the asteroid. Usually with smaller separation there are only primary and secondary events with the primary showing deeper attenuation due to blending of the eclipses on to the main body and transit of the satelite as shown as an example here. Another 2 publications has been put through in to Minor Planet Bulletin (MPB) with the title of " Light curve analysis of 1495 Helsinki" and " Rotation Period and amplitude change of 3868 Mendoza" in Volume 34 number 1 and Volume 34 number 2 respectively. A forth publication is in the making and will be submitted for Volume 34 number 3 sometime in April. It has been a relatively unproductive summer due to un-seasonal(?) weather condition allowing only approximately 10-15% clear weather for photometric work. Therefore the time has been spent mainly in reading and compiling all the necessary work associated with MPB publication. Furthermore, the long awaiting opportunity to expand my equipment used for photometry has arrived in the form of an SBIG ST 402ME camera. This camera is used in conjunction with my secondary telescope mounted permanently in my backyard (look at My Telecope link above). The preliminary work and subsequent observations indicated that the system is fully functional and ready to carry out regular photometric observations from Sydney at an altitude of about 60m. Unfortunately the location is such that blockage from surrounding trees causing any views north of +5deg Declination is restricted to only 2-3 hours at a time during summer time. Most of the work will be for Southern hemisphere objects. Winter will allow more targets to be studied. Another restriction is instrumental in nature. The 10" diameter telescope and urban light pollution means that a 5 minutes exposure will allow a 14.5 mag object a precision of about 0.01 mag, sufficient precision for a lot of unobserved asteroids in the Southern hemisphere. Increasing the exposure to 10minutes may improve ability to observe fainter object. Currently I haven't attempted that yet. Preliminary work certainly show that it is possible to image down to 15.5mag at 0.02 estimated precision. Work on the minor planet 1301 Yvonne is now complete and the next target is 1244 Deira located in the constellation of Corvus. A preliminary synodic period for 1244 Deira is 6.70h + 0.01h. Oh yes, I added the little weather report if you are curious of the weather at Leura which is about 5 km from Katoomba. The first publication of my light curve analysis in to Minor Planet Bulletin(MPB) has been accepted. It will be in Volume 33 Number 4. The 10 light curves observed so far will be published. All except 7033_1994_WN2, 3665_Fitzgerald, 3868_Mendoza, 1495_Helsinki and 1241_ Dysona. The first 3 are projects associated with Photometric Survey for Asynchronous Binary Asteroids. The last 2 will be published separately at a later date. The 7033_1994_WN2 is a relatively faint instrument mag 16.7 asteroid. It is discovered in 1994-Nov-28 by Ueda, S., Kaneda, H. at Kushiro. H value (absolute magnitude) of 13.3 . Its an inner main belt asteroid (MBA). 3665 Fitzgerald is discovered in 1979 Mar. 19 by A. Mrkos at Klet. Named in memory of Ella Fitzgerald (1917-1996), renowned jazz singer known internationally as the "First Lady of Song". A phenomenal improvisationalist who used her voice as if it were a musical instrument, she was also known for her albums of definitive performances of the works of many of the leading songwriters of the first half of the twentieth century. Name proposed by M. Tichý and B. G. Marsden. This object was suggested for Leura Observatory due to its faintness and the instrument ability to reach 17th magnitude. I continued for the rest of the June month following the work done by David Higgins from Hunters Hill Observatory. There are indications that the asteroid is binary. Unfortunately the effort has been postponed temporarily due to bad weather and full moon near the end of June. I continued my search with asteroid 3868 Mendoza during the month of July during full moon and for the rest of the month. It has an H value of 13.0. Discovered by PLS at Palomar (675) in 24th September 1960. It is another inner MBA. Bad weather has hampered the search only allowing 5 full nights session so far and there is no sign of the subsidence of the unseasonable storm. The plan now is resume observation on 3868 Mendoza. I feel very strongly that 3665 Fitzgerald should have equal share of observing time but with just 1 instrument, its difficult to utilize and maximize efficiency during clear nights. The best solution would be another instrument focusing on the brighter object while Leura observatory will focus on the dimmer ones. Unfortunately now 3665 Fitzgerald is at mag 17.3 and way past opposition with only allowing 5hours max session per night. At declination of -10deg, I think that most of the northern hemispheres observer will find it too southerly to tackle. Currently my 10" SCT scope is not fully operational. It is ready for a second setup requiring only a camera/detector. I will endeavour to find means of obtaining another camera for this set up. I find that by keeping the measuring aperture slightly larger then the asteroid when selecting the Star-B-Gone feature, the light curve will be relatively accurate. This is in comparison with adjusting the measuring aperture too small until its just cover the asteroid or too large. Also the reference star should be about 70% of the maximum value of 65000and all faint stars should be "cleaned" out . It is wise to do another measurement with out Star-B-Gone and compare the raw light curve with the one with Star-B-Gone. This will give me an idea whether the elimination create a clean result or some leftover artifact. Indeed, a third run will help with different reference star of different intensity. When it comes to working with 3868 Mendoza where the light curve amplitude is about only 0.1 magnitude and the error is in the range of + 0.05 magnitude, the uncertainty factor overwhelm the actual data that some of the resultant stray points needs to be eliminated. Still, its a big jump towards eliminating the crowded star field problem. Complement goes to Brian Warner of MPO Software for a great product. There have been detections of attentuation from MP 3868 Mendoza's light curve which may indicate the presence of a satelite. However, its still early to be certain of it at this stage. More data is required to confirm the existence of this object. Unfortunately no time has been given for MP 3665 Fitzgerald. It has reached mag 17.1 now which makes it near the detection limit of my setup during clear nights with no moon. Since no other observatory will be attempting on this asteroid, the continuation of data gathering will have to be abandoned. Its been a week since the last observation made on Minor Planet 3665 Fitzgerald. A combination of bad weather and problem with the dome has temporarily post-poned any observations. This should soon be rectified perhaps in 2 days time. Mean while, dome control software has been gradually improved to provide better control and improved reliability. I can at last sync The Sky6 with the CGE mount. This will mean shorter delay during the meridian flip which code will eventually be incorporated into a script. Automation for meridian flip is closer . Pitty I don't have the luxury of getting an off-the-shelf software like the ACP4 or CCD Commander to control the telescope and the dome. The dome by AstroDome is not automated yet. After joining the Photometric Survey for Asynchronous Binary Asteroids , my first attempt is with the Asteroid 7033_1994_WN. Its an NEA with a period of 2.8155 h +0.0005h. Although it was a suspect binary asteroid, the discovery evade us for this time. The next attempt will be a successful one. Some of the earlier work such as 171 Ophelia has been sent to Asteroid and Comets Rotation Curves by Raoul Behrend of the Geneve Observatory . Once the 10 " SCT is operational with a new camera, further work can be added to shape determination survey such as the above. The weather has been rather awful lately. The observatory is momentarily closed due to the severe humidity, it has played havoc on the mechanism of the observatory motor and there will be further improvements later in the month. The idea is to lift the observatory using a crane and place a modified steel ring at the base of the observatory to provide a good and smooth glide motion as the dome rotate. This is important when automation is required since the movement of the dome will have to closely match that of the telescope. The dome is one of the earliest version of Astrodome. In the past 2 months, most of the problems mentioned here for remote astronomy has been full filled . A compromise has been found regarding problem associated with closing the hatch. If there are signs and indication that weather is going to turn for the worse in 24 hours, observation will not be performed. This guide line has worked well. I am now into the second months of continuous gathering of Minor Planet images using remote telescope situated in Leura, Australia. Minor Planet Photometry is the subject matter. Most nights when the sky is clear the telescope is functional for about 7 hours per night. The photometry reduction software , Canopus by Brian D Warner , was used and the results are shown in the Light Curves page. Its easy to use although the usage and understanding of the program needs to be learnt. Brian has been extremely helpful. Photometry is an interesting field of astronomy. The easiest way to learn is by association ie gathering all required information and data for processing then reduce it in an easy to use software followed with a good book explaining all that was being processed. My name is Julian Oey. 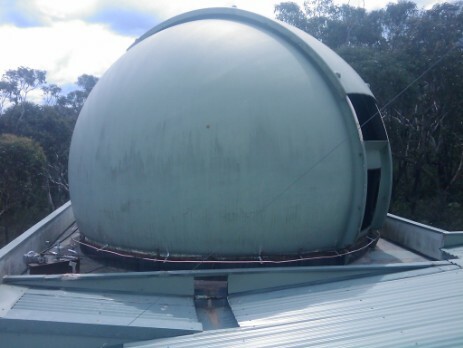 I operate a private observatory in a Blue Mountain town, Leura. I have dabbled with imaging minor planets for about one year now. Precision astrometry is what I am trying to achieve now. Its all started with Greg Crawford from Bagnall beach observatory and the weekend work shop organized after the International Astronomical Union meeting in Sydney, Australia. Astronomy has been my keen interest for a long time. I took a lot of astro-photos for a while from my observatory in Leura using the instruments described in my equipment page. Most images are of Southern Sky galaxies. Although I have some success and happy with the result, I felt the need to tackle some other challenges in Astronomy mainly using my existing equipment. Aperture fever caught up with me during my search for a faint Near Earth Asteroid. The CGE 1400 added to the collection in January 2004. It was a fine instrument with fantastic optic. More asteroids are within the grasp using the new telescope. I am now planning for a second camera, so I can start to use both equipments concurrently increasing the efficiency. Astro-photometry is also in the pipeline. All this is made possible by the tireless effort of those people working at the MPC (Minor Planet Center) and all information they provide.